VBC Steps Over the Sea! I received an email from my boss in June saying that my schedule had changed and that she thought I would be pleased. I was then informed that I would be spending my summer in London…to say this girl was pleased is quite an understatement. I had three weeks to wrap my brain around the fact that I would soon be sharing the streets and pubs with Kate, Harry, and Lily! It was the night before my trip and time to pack. It was 10:00 PM and I was out of excuses to put it off so I begged a girlfriend of mine to sit in on my packing session. I needed packing support in a major way. I really encourage all travelers who despise packing as much as I, to have a friend present to help get you through the painful two or more hours it often takes, especially when you are staying somewhere for an extended period of time. Especially, especially when you are going somewhere really fabulous like London and must look effortlessly put together every second of every day! 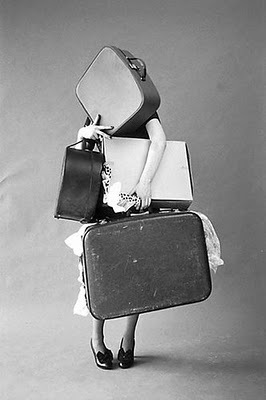 So as you can see, it’s very easy to get carried away while packing and it is most necessary to have P.S. on hand to keep you grounded when you start to slip away from reality, which I often do. And I am not knocking the dream world, I spend most my time there and find that life is much more exciting and enjoyable in my head, however it is very important to be grounded when doing things like packing (Tears are real when you realize you desperately need that cream, lace dress and it’s hanging in your closet), ghetto cruising (Defeats the whole purpose of driving through the ghetto) , and while having serious talks with your boss, police officers, or your crush after having a bit too much to drink at 3:00 AM. So I packed my life away and was ready for my big, fabulous, extraordinary, amazing summer in Europe! The plan was set, to leave for London the following day and then head to Paris for the weekend. I made up my mind that I was spending the Fourth of July laying on a blanket under the Eiffel Tower with a bottle of wine. I envisioned fireworks (Wasn’t even sure if they celebrated the birthday of America in France, but in my head they sure did! ), wine, and a very romantic evening spent with my new Parisian crush who would soon become my summer boyfriend and would be traveling to London on the weekends to visit me! Au revoir America, bonjour Europe!